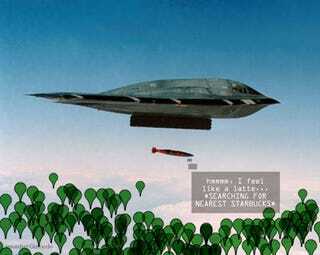 This is a B-2 plane dropping a bomb equipped with the Joint Direct Attack Munition guidance kit. The kit adds inertial navigation and global positioning systems to the tail of traditional warheads. Unlike the more expensive traditional TV or laser guidance systems, which only work well in good weather, these bombs use the same GPS that you have in your car to hit targets like Osama Bin Laden, Ronald McDonald and Paris Hilton under any meteorological conditions. If you know where they are hiding, that is. And if they are not moving. There's also a version that uses laser (called LJDAM) to further increment precision, 600 of which have just been ordered by the US military, citing "compelling and urgent operational needs." No kidding. The LJDAM comes at two price points: $48,000 apiece for people who want to mount them on planes, and free for people receiving them on the ground, delivery included.